On Thursday, June 5, Patagonia presented the award-winning, feature length documentary DamNation, at Patagonia Retail Stores in 23 cities nationwide. Our local Great Pacific Iron Works sponsored the evening event in Ventura. The community came out in force, over 500 people packed into the outdoor "tin shed" courtyard behind the retail store. After the film the Q&A featuring Yvon Chouinard and Paul Jenkin drew many informed questions from an audience that was fired up to help remove our local deadbeat dam, Matilija Dam. Proceeds from the sales of donated Stone Brewery beer and a Patagonia product raffle went to support the Matilija Coalition! The Matilia Coalition was also part of the May 21 showing at the Lobero Theater in Santa Barbara. That event also sold out with over 600 attending! 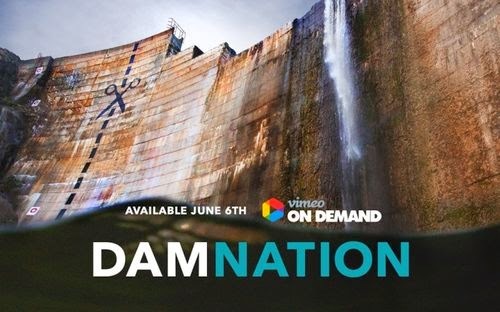 Starting on June 6, DamNation is now available at Vimeo On Demand for digital viewing. DamNation will be available to rent ($5.99) or buy ($9.99) for viewing on almost any device. Also check out the Patagonia Collection on Vimeo On Demand. Surrounding the film’s appearances at festivals and other events around the country since March, Patagonia has asked people to get involved and ask President Obama to authorize studies on removing four problematic lower dams on the Snake River. To date, over 25,000 people have signed the petition asking the administration to “crack down on deadbeat dams” – signatures that will be delivered to the White House at a later date. Since its world premiere at the SXSW Film Festival on March, DamNation has been hailed by The Los Angeles Times, The Village Voice, National Geographic and Time Magazine. Patagonia founder Yvon Chouinard recently published an op-ed in The New York Times arguing for the removal of low value, high cost dams. Aside from telling the story of our endanger salmon runs and the recent large dam removals, the film is a must-see for anyone with lingering curiosity about the scissors on Matilija Dam!